Potato skins for breakfast? Why not! 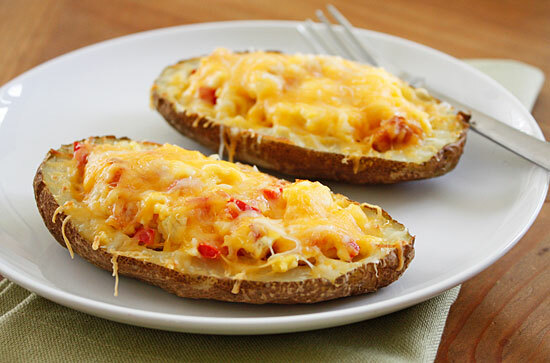 Potato skins stuffed with scrambled eggs, ham, pepper, onion and topped with reduced fat cheddar cheese, it’s a perfect breakfast combination. Pierce potato with a fork a few times all around. Place in microwave and cook about 5 minutes per potato. When finished, allow to cool enough to handle. In a large bowl, whisk eggs, milk, salt and pepper. 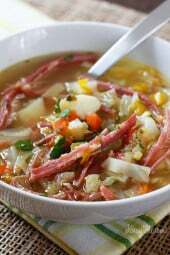 Add onion, pepper and ham and mix well. Spray a medium nonstick skillet with olive oil spray and cook the eggs, mixing often. 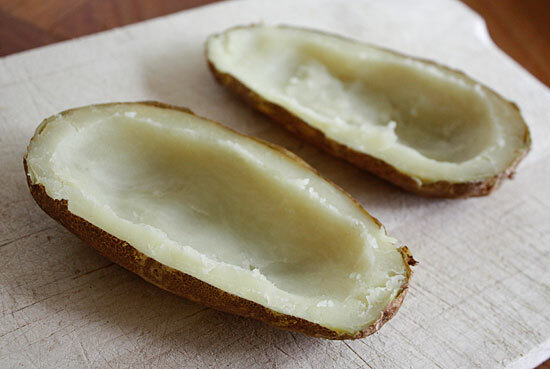 Lightly spray potato skins on both sides with oil. Fill with eggs and top each one with 1 tbsp cheese. Place on a baking sheet and bake 5-10 minutes or until cheese is melted. I just made these for an easy weekday breakfast – so delicious! I made it into 4 servings, one skin per serving, and it still left me feeling pretty good and full. Thanks for another great and easy breakfast idea! I made these for my mom for breakfast yesterday and she loved them! they are so easy and really tasty! I made these for lunch today with leftover baked potatoes from dinner last night. Served them with strawberries and the kids BEGGED for more. Thanks for giving us a new go-to recipe for an 'anytime breakfast'. 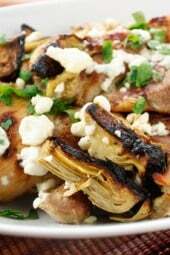 I just made these for dinner last night, and they were great! They were so filling, and each bite had a lot of delicious flavor. Since my husband was eating too, and he never seems to get full, I filled his potato skins with the scooped out potato, and more ham. That way, we were both happy! The only downside is that I bought Kraft reduced fat cheddar, and it didn't melt very well. I will have to find another brand I think. I made these skins this morning and it was so fast and easy. Thanks for such a great idea. Delish. Fabulous breakfast idea! After scooping out the skins I "fried" the excess potatoes then added the eggs and had scrambled eggs/potatoes which then went into the skins topped with cheese! Then after coming out of oven topped with a tablespoon of Fresh salsa!! I know it added more points, but RARELY have potatoes!! we host a tailgate party every year and these will be a perfect addition!! If you have any other "tailgate" party food recommendations, please point me in the right direction! Thanks so much! Yum! I'm making these for dinner! I'm confused where did you go? why no more recipes? I think that would work out perfectly! Do you think you could put these together the night before and then toss them in the oven in the morning? I love hot sauce on my eggs! This is such a delicious and filling breakfast!! The hubby said it could have had more spice so I think topping it with a little tobasco would give it a good kick. Next time I may use crispy turkey bacon instead of ham. I doubled it and we had enough to last most of the week. And I love delicious for bookmarking. It's a great site. I think people that don't have lap tops tend to want to print the recipes. I hired someone to fix it, I hope printing works now! So is it three egg whites in addition to the two eggs? Also, for those looking for printer-friendly/printer-free, delicious.com has a really excellent bookmarking system that makes bookmarks easy to search and tag. I never print my recipes- with delicious, I have a whole cookbook that I can bring to the kitchen on my laptop. Plus, since it's internet-based, it can be accessed from any computer as long as you have your account info. Just a suggestion! Sounds wonderful! Glad your week is a little bit easier!! had this for breakfast today. i love how filling it is. so good! instead of ham i used turkey sausage and turkey bacon. love your ideas for success! your recipes have made this week wonderful. Oh gosh–how good does that look?! I might give it a Mexican twist to spice it up a bit! Some diced chiles/tomatoes, Mexican cheese blend and taco sauce?? Yum! I love this idea! I'm always looking for fun new breakfast ideas. Thanks! Firefox is free, I highly recommend downloading it and all the recipes will print perfectly!!! @KCatGU Thanks for your comment. It should print fine if you update Internet Explorer or use Firefox. I notice people clamoring for "Printer Friendly"
Annie at http://annies-eats.com/ accomplishes this by giving a hyper link to Google Doc. Just thought I might add that idea to the hat. For people reading this you should be able to just highlight the text (and pictures) you need to print. Select print and in the print window that opens, go to "Print Range" box change the little button from "All" to "Selection" and it will print very nicely. The key with this it to be careful in highlighting the text and not to inadvertently get some of the side pictures too. Love the recipes but have a very difficult time getting them printed. Pages over lap and writing is on top of writing. What is it that I'm not doing right. PLEASE provide a mechanism to print a single recipe. Have to jump through too many hoops (Copy into an e-mail, slice, dice & julienne) to print a single recipe. 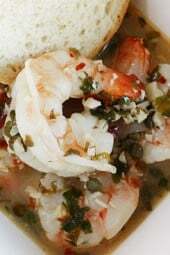 A number of the recipes that are posted sound really good, but they're a hassle to print. Thanks! Thanks Karyn, what a great idea. I'm going to do the same thing. We love potatoes for any meal, so these are perfect. Thanks so much Gina for the recipe. Love it. Anonymous..I copy the receipes,then copy to my email,send it to myself with the receipe name in the subject header.I then started a folder with Gina's receipes..so with one click I can find any of her wonderful receipes! I think it would freeze well if wrapped. No worries, I did not through out the scooped out potato. I made baby food with pureed veggies for my 9 month old! But, you can also save it for skinny mashed potatoes! WHOA! Hold on just one little second Home Slice! Where is the scooped out potato??? You didn't trash it did you? If you did I might have to lay down for a while. Poor lovely potato guts! Wait…I'm weak with hunger. Each poor gutted potato skin half is supposed to weigh 2.5 oz or BOTH halves? Yes, I'm technical but only because I want every stinking oz of everything I can get my teeth on! LOL! 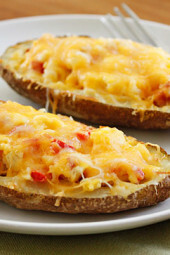 I was originally thinking of making them as stuffed peppers, but U think the potato is genius! WHY DIDN'T I THINK OF THIS? This will be breakfast on Saturday morning…plus, I bet you could wrap and freeze them for reheating…I'll work on that. My BF loves breakfast for dinner, this would be a great one! This sounds like a perfect breakfast for me. Do you know if they freeze well? I like to batch cook for the month. These sounds so good! Two of my favorite foods put together. I can't wait to try it! This sounds so great! 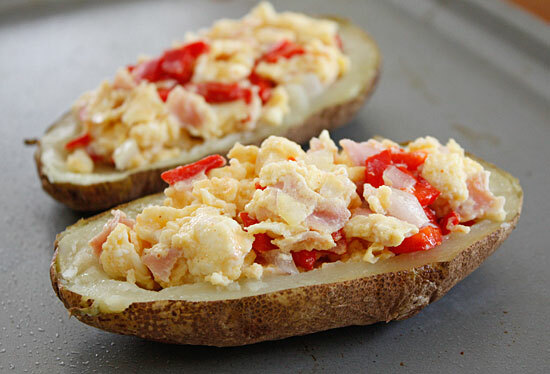 My husband would LOVE this too, he's a big fan of breakfast potatoes. I love how versatile the ingredients can be! That is correct. This is for two people, 2 potato skins per person. It's a filling breakfast, bit if you only want one skin, then it's 3 pts each. Have fun with this! You can do eggs with veggies like mushrooms, broccoli, etc and keep it vegetarian. It's so yummy! I love, love, love potatoes. I'm trying this one soon! I guess the recipe is for TWO people therefore ONE potato per person. since 1 potato= 2 skins ?? It says a serving is 2 skins and the recipe makes 2 servings, therefore, 2 potatoes are needed. One for you, one for me and we each get 2 halves.